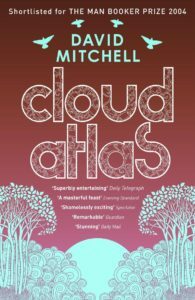 Cloud Atlas by British author David Mitchell is beautiful. It’s tough, challenging, frustrating, rewarding, and exhilarating. It’s written as a series of short stories, and I rarely get through short story collections because just as I become attached to a character, his or her story is over. But I love Cloud Atlas. I read it in a weekend to try to get this article out around the time of the movie’s release, but even without that I bet I’d have devoured it almost as fast. There’s no central character in Cloud Atlas, just a central soul. Or one might say that the central character is human nature. The novel tells six stories about six different people in six different eras and locations. But by the third story it’s clear that we’re following the same soul; each protagonist is the reincarnation of the prior. We’re not at all following the same person. All of our leads are vastly different people, and I’d be hard-pressed to find many similarities between them. We follow Adam Ewing, a San Francisco notary from 1850 as he makes a trans-Pacific journey; Robert Frobisher, an aspiring composer and all-around cad as he works as an amanuensis for a famous composer in Bruges; Luisa Rey, a 1970s investigative reporter seeking to expose a nuclear scandal on the California coast; Timothy Cavendish, a 21st century English publisher on the run from debt collectors; Sonmi~451, an ascended, autonomous clone working to free others of her kind in a futuristic Korea; and Zachry, a Sonmi-worshiping tribesman who lives in what was once Hawaii centuries after the fall of civilization. In the last story, it is Zachry’s companion Meronym, member of a tribe who clings to the last remaining bits of technology, who bears the birthmark held by all the reincarnates before her. Each section stops midway through the story before proceeding to the next (in chronological order), except for Zachry’s. His is told to completion, and then we descend back through time to finish the others. Don’t look for many parallels between them; the only threads connecting them are thematic, the only signs of the characters’ prior lives the birthmark, and the fact that each incarnation encounters some hint (a song, a story, a movie) from their prior lives. Mitchell’s writing in Cloud Atlas is stunning. I can barely believe that the man who wrote Adam Ewing’s letters (and kept sending me to my Kindle’s dictionary feature) is the same who scribed Frobisher’s wry 1930s wit or composed Zachry’s at-times almost indecipherable, rambling storytelling. All of these characters think differently, act differently, and talk differently, the latter serving as a stark contrast between each vignette. A mark of a strong author is often his or her distinguishable writing style. 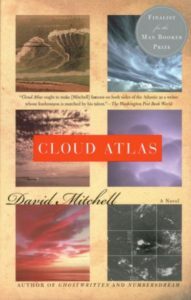 I’d need to read another novel of Mitchell’s to identify his, so chameleon is the writing in Cloud Atlas. From a writer’s perspective, I’m floored at the fluidity of his skill, and from a reader’s perspective, the contrasting styles of each story seep into my pores, and immerse me in what’s being written. The narrative style of each section changes, which further helps to separate them from one another. The first two are epistolary, Ewing writing in a journal and Frobisher sending letters to an unseen figure named Sixsmith. Rey’s story is told by a third-person omniscient narrator, Cavendish’s by himself as he composes his memoir, Sonmi’s adventures are told in interview-style and thus switches back and forth from first-person and third-person narration, and Zachry’s reads like it’s a transcription of a spoken story. It’s appropriate that each section be so different (and staggering that Mitchell pulls off the contrasting styles so well), because they’re not contributing to an overarching plot. Having them all read so differently helps prevent readers from wasting time combing through each one looking for hints of a building plot or climax. Each story has conflicts and arcs of its own, but the primary connection between all the sections of the book is thematic. Cloud Atlas is telling a story about the unchanging darkness in human nature. I’m an optimist, and I usually like to read for escapism. So I’m surprised that I can so love a book that has an almost cynical/depressing message. Mitchell himself has said the story is about “predacity,” or the impulse individuals, groups, countries, etc., have to prey on one another. Each story shows this a little bit; some of our characters are good people, some are selfish, some are fearless and dedicated to others, some are self-absorbed, or well-intentioned but ineffectual. Sometimes they’re the ones doing the preying, or being preyed upon. Sometimes it’s on an individual scale, other times it’s a corporation to the public, or one country to its people, or even the human race to the world. Cloud Atlas uses the travels of one soul through time and space to indicate that, no matter how the world has changed, the nature of humanity does not. Sometimes the strength in the human spirit triumphs, and other times it capitulates to its basest impulses. The best we can do, as Adam Ewing closes the entire novel deciding, is to make our own stand against it. In his case, he’s decided to reject the bigoted assumptions with which he was raised and fight for abolition. He won’t be daunted by the enormity of his decision. Our lives might be a battle against the darker side of human nature, he decides, and our own efforts to thwart it might seem too tiny and futile. But enough individual efforts can become legion. It’s horrible, then, that the Cloud Atlas film adaptation displays one of the worst sides of human nature. Trailers and promotional photographs from the film show actors Hugo Weaving and Jim Sturgess (among others) decked out in yellowface to play Korean characters in Sonmi’s story. Just about everyone in this movie plays multiple characters, and they all wear layers of makeup to do so. Everyone gets to play a race of which they’re not a member, but having white actors don yellowface is ignoring decades of ugly racism in films, and it’s unacceptable (if you’re not sure why, go here for a much better explanation than any I could give). It’s not even supported by the story; in the book, the only character to reincarnate is the lead, and in the film there are already multiple actors playing the lead at different times. But I don’t want to taint a discussion of the novel with the awful decisions made by its film adapters. I suppose the book’s theme could be used to explain it: sometimes we prey on others without even meaning to. All we can do is dedicate ourselves to the struggle against the dark side of human nature, in whatever ways we can. The moral of Cloud Atlas might be a bit depressing, but it’s hopeful in a way as well. Centuries pass through the course of the novel, and while there’s always bad, there’s good too. Mitchell’s work is eloquent, managing to be both enormous and intimate. It’s ancient in theme, but inventive in style. I’ve never read anything like it, and I don’t know that I’d seek out something similar. Reading the novel was a singular experience, and I want it to remain so. You can find Cloud Atlas on Amazon.